This is exactly what I needed for a particular wardrobe. The earrings have gotten several compliments. Well made and distinctive! 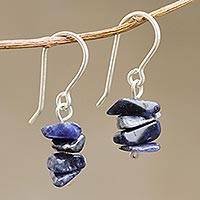 'Gate to the Sky', sodalite dangle earrings has a very dark blue stone and matted silver setting, as pictured. The 'Gate to the Sky' ring which I also bought has the same shape setting, colored stone and silver finish. I bought both jewelry items to match a necklace that has small sodalite stones and white crystal. 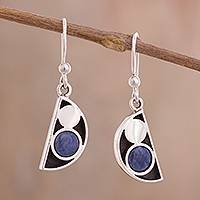 The earrings and ring sodalite is a lot darker blue, but still look good together. 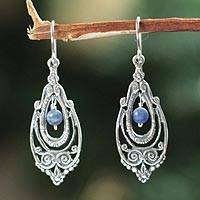 Probably because the silver is not highly polished and the shape of the earrings is simple and has a refined, subtle appearance. The stone has a smooth, mirror like finish. The earrings are very pleasing to the eye...dangle, definitely hang down, but not so long as to be garish. Solid, well made. Happy with purchase. Sodalite dangle earrings, "Inca Priest"
Handmade Sodalite Beaded Dangle Earrings, "Nature's Harmony"
Modern Semicircle Sodalite Dangle Earrings from Peru, "Blue Crescent Moon Phase"
Sodalite Chakana Cross Filigree Dangle Earrings from Peru, "Blue Mountain Chakana"
With its deep blue tonalities, sodalite is an exceptionally beautiful stone. It is a deep royal blue, and is sometimes known as "princess blue" for Princess Patricia of Connaught, Queen Victoria's granddaughter. Princess Patricia visited Ontario soon after vast deposits of sodalite were discovered there, and she used the stone in decorating her home in England. 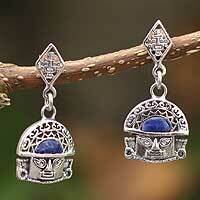 The gem finds a showcase in Novica's Sodalite Earrings Collection. 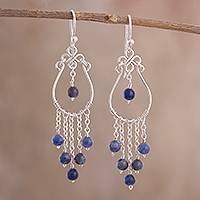 From elegant chandeliers and waterfalls to lacy filigree and sleek contemporary earring styles, its presence is mesmerizing. Silver is the setting of choice for our talented artisans and jewelry designers from around the world. 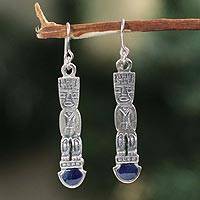 Novica's sodalite earring collection includes many different styles, all embellished with the dark, denim beauty of blue sodalite. We invite you to look through our collection and also view other kinds of jewelry with the beautiful gemstone. 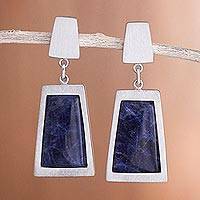 You'll find the perfect complement to your earrings in the sodalite cuff bracelet, necklace and anklet. Enjoy!